Red-eyed Vireo is a small bird, olive-green above, and pale yellow and white below. It has a rather prominent whitish supercilium, and distinctive grey crown. The supercilium is highlighted by both dark eye-stripe below, and a dusky lateral crown-stripe above. Adult has ruby-red iris, difficult to see in the fields. Juvenile has brown eyes, and this colour persists through the first winter. In fresh plumage in autumn, first winter and some adults have distinct pale yellow wash on flanks and ventral region. It has a bulky, relatively short tail, and distinctly stout legs and bill. 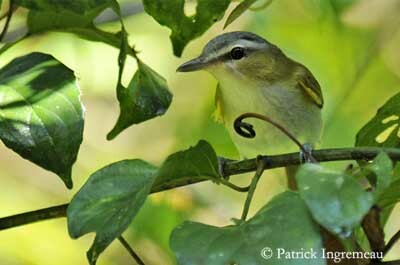 Red-eyed Vireo feeds mostly on adult insects and larvae, especially caterpillars in summer. In late summer and in winter, they also eat berries. 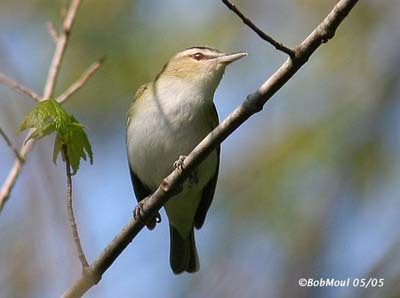 Red-eyed Vireo is threatened by the parasitism of Brown-headed Cowbird. Populations decline from parasitism and degradation and loss of streamside habitat. Most likely call to be heard is a nasal, querulous “tshay” or “chway”, although migrants are usually silent. Calls include a nasal whining “quee”. Persistent song, sung all day, a variable series of deliberate, short phrases. During courtship and nesting seasons, their repeated calls reveal their presence. Their persistent song is legendary. It is repeated as often as 40 times a minute, all through the day. Red-eyed Vireo breeds in mixed forest, parks and large gardens. It’s common in deciduous woodlands. From Canada to the Gulf of Mexico. It winters from north-western of South America to Amazon area. Red-eyed Vireo is highly territorial on breeding areas, and it’s very noisy. When it’s wintering in South America, it does not sing. During the courtship, male performs displays, flicking on its legs, with fluffy feathers and fan-shaped tail. During incubation, the male sings faster, 50/60 phrases a minute. When it stops, female comes off the nest and it feeds her, or they feed together. They are monogamous. 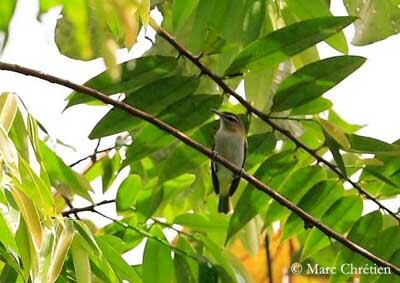 Red-eyed vireo is difficult to see because it forages high in the canopy, picking food from the undersides of foliage, hopping or hovering in the leaves. It is an arboreal bird of the canopy, where it is very active although rather heavy in its movements, maintaining a horizontal posture. Red-eyed vireo ejects small pellets formed of the hard crusts of the abdomen, legs and other parts of insects. This species migrates over long distances, and mostly at night. The small territory of this species consists of a cylinder extending from the forest canopy to the low understory. Red-eyed Vireo is relatively heavy when moving over short distances, but it can be very active too. Its flight is altogether performed in a gliding manner, and when it is engaged in pursuit of a rival or an enemy, it passes through the woods with remarkable swiftness. Nest is built 1, 5 to 20 metres above the ground. Female builds the nest in five days, without assistance from the male. Nest is made of vine-bark strips, grass, needles and twigs. The outer parts are firmly attached to the twigs, the fibres being warped around them in various directions. The lining is beautifully disposed. It consists of fibrous roots, grasses, and sometimes the hair of grey squirrel and raccoon. It is covered on the outside with wasp’s nest paper, and spider webbing. It is a typical vireo nest, suspended by its rim from a horizontally forked twig, or the corner of a tree trunk, and two radiating branches. Female lays 3 to 4 eggs. Incubation lasts about 11 to 14 days only by female. Both parents feed the young during 10 to 12 days when they are in the nest. Female and perhaps male, continue to feed them for up to two weeks after they leave the nest.